The most rugged, longest lasting portable restroom (toilet) in the industry. Polycon Portable Toilets provide you with a quality solution when you need a portable restroom for temporary public events, playgrounds, parks, job sites or urban settings, adequate sanitation and change facilities. 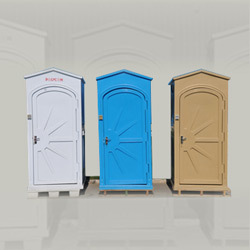 Our portable toilets are made of UV Stabilised Polyethylene giving stability and eliminating the problem of rotting foundation. Now also available in Indian Style.